Stampin' With Leah : I'm a Ray of Sunnshine. I'm a Ray of Sunnshine. 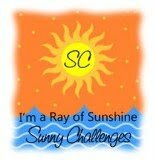 So exciting, I won the Sunny Challenges 061/12 challenge with my lovely butterfly card. Thank you. This weeks sketch is up so head over and join in the fun.